How much does it cost to travel to Santa Marta? How much money will you need in Santa Marta? CO$75,179 ($24) is the average daily price for traveling in Santa Marta. The average price of food for one day is CO$27,076 ($8.61). The average price of a hotel for a couple is CO$65,919 ($21). Additional pricing is in the table below. These average travel prices have been collected from other travelers to help you plan your own travel budget. How expensive is Santa Marta? How much money do I need for Santa Marta? Santa Marta is a city in the Magdalena Department of Colombia's Costa Norte. Over the last decade, security has steadily been replacing the shadow of the Colombia's violent past. 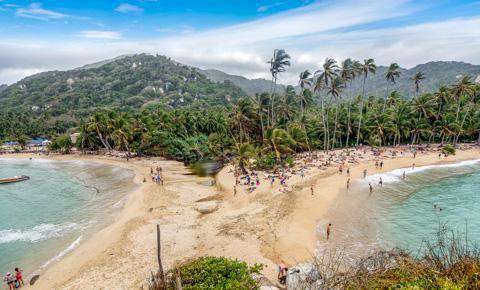 One destination in Colombia's northeast region is now attracting more international visitors: the coastal Caribbean area of Santa Marta. Established in 1525 by the Spanish as a base of conquest, Santa Marta sits at the foot of the world's highest coastal mountain range, the towering Sierra Nevada de Santa Marta. It is South America's oldest European-founded town and the second most important colonial city on Colombia's Caribbean coast. While many travelers complain about Santa Marta's horrible traffic and unsightly urban sprawl, the city holds a numerous amounts of great hotels, bars and restaurants and holds a few fantastic destinations nearby to which you can go during the daytime. Santa Marta's landscape consist of hot springs, crystal-clear rivers, cascades and a number of pristinely beautiful beaches. Start exploring this charming colonial city and get a taste of the local life at the Parque de los Novios and its leafy central plaza surrounded by restaurants and bars. The Rodadero is one of the most important tourist areas of the city due to the fact that it has the largest number of hotels, a variety of restaurants, bars and nightclubs so that you can experience a very unique stay. Live musicians and beach bars are the primary nighttime entertainment in this electric neighborhood. Those who have come to Santa Marta for beautiful beaches, this is your spot. Head to the gorgeous Playa Blanca, located on the other side of a headland just a short trip from the city. While this stunning stretch of sand is lined by a number of basic local restaurants, visitors still manage to feel miles away from the big city. Finally, visit the Quinta de San Pedro Alejandrino beautiful country estate where revolutionary hero Simon Bolivar lived out his final days. As Colombia's premier beach destination, there are plenty of fun things to keep a traveler busy in Santa Marta. Check out to the stunning Tayrona National Park to end up on some of the best beaches in all of South America, where lush jungle scenery edges right up to the white sandy beaches and turquoise water for which the park is famed. Just north of town is Taganga, a tiny fishing village on the border with Tayrona National Park. Some come for its laidback small-town vibe, while others stick around to learn how to scuba dive on one of the most cost-effective PADI courses in the continent. Another incredible adventure is to trek to the Ciudad Perdida (Lost City). This spectacular indigenous citadel pre-dates the Inca and is a breathtaking sight surrounded by exotic jungle. Not for the faint of heart, a visit to the archaeological site requires an intense four to five-day trek through a difficult trail. Stop by the Museo del Oro to learn more about the history gold and the region. You can also go for a day in the charming town of Minca, only an hour's drive from Santa Marta's city center. Go for the day or stay overnight to really get to know this beautiful section of the Sierra Nevada mountain range and enjoy the organic coffee farms, jungle hikes and refreshing waterfalls. Seafood, fish, carimanolas, egg arepas, yam and sweet fritters as well as preparations with green bananas (unripe banana) are essential components of local cuisine. Ceviche, fresh fruit, and lobster are all widely available in Santa Marta's street stalls for only a few dollars. Head to the ocean promenade known as Avenida Bastidas for an unbeatable outdoor dining experience with spectacular ocean views. The cayeye, a dish made with unripe banana is a good example of traditional cuisine of Santa Marta. The Simon Bolivar airport, which has the same name as the one in Caracas in Venezuela has non-stop flights from Bogota and Medellin. It is located along the beach, 20 min south of town, but much closer to most of the beach resorts and only 10 min from El Rodadero, Santa Marta's main beach. The bus station is all the way out of town on the main highway and it will cost you between USD$1.75 and USD$3 to be dropped off near the beach in taxi. To avoid any trouble, you should fix the price before you get into the taxi. There are also mini buses that will bring you anywhere in the city for USD$0.50. Bus rides are available from Medellin (15 hours), Barranquilla (2 hours), Bucaramanga (8 hours), Bogota (16 hours) and San Gil (13 hours).